Why The House of Miniatures (THoM)? It’s no mystery that I, like many of you, love the miniatures kits produced by THoM from 1976 to 1996. But why? Let me tell you my story, then I’ll look forward to hearing yours. In 1977 I was 14 years old and my home was in turmoil, but I was having the time of my life. My mother had recently left her second husband. My grandmother had joined us in renting a home that fall. Gram and I were great friends. We often explored old houses, went to miniatures shows or to rock collecting meets on the weekends. She would be at home on weekends. Mom was making her way in her new career of “mixology”, otherwise known as tending bar. Weekends became mini time. In the spring of ‘77 I had made a dollhouse for my baby sister in wood shop. My grandmother and I were working on finishing it with things we picked up at shows. We didn’t have much of a budget. She hooked a tiny rug, seen in the lower right of the picture above, and made decorations. I read through the miniatures magazines and dreamed up ideas for the outside of the house. That’s when The House of Miniatures ads for kits by mail caught my eye. All it took was One Dollar to get that first kit, a chest-on-chest dresser that I built myself! I loved building model cars and had learned some tricks in wood shop. I was ready to fill that house with colonial furniture like I saw in the old houses of New England and in the Colonial Homes magazine. We received and built several kits before the money ran out. Soon the fun times ran out, too, as my mother patched things up with her husband. He moved in and my grandmother moved into her own apartment. Soon we were moving, too. By early 1979 I put the dollhouse in the basement. I started working as well as going to school, and after I turned 16 I found many new interests. It was many years before I rediscovered miniatures as a hobby. My youngest daughter loved log cabins and I found a log cabin dollhouse and some furniture kits at a flea market in November of 2004. I gave her the house for Christmas and set about building the rustic furniture kits. They were okay kits, but nothing like the quality of THoM kits. I mentioned to my wife that I had built kits when I was a teenager. She reminded me that there was some dollhouse stuff in her boxes of craft supplies. My older daughter received them when my mother passed away. We looked, and sure enough, my old The House of Miniatures kits were in there. We also found the rug my grandmother made and some other odds and ends. That started me back in the miniatures hobby. I built kits, built some houses, and built web sites. Life is funny, full of circles, laced with scraps of memories that cross generations. A few years later I was looking to acquire more THoM kits. I had a hard time finding information on them, even though the kits were very popular on eBay. So I decided to collect kits, gather information, and to contact Houseworks to find out what had happened to The House of Miniatures. They told me that once the subscription model had played out they gave up the manufacture of kits. They sold out their supply through their sister company, Hobby Builders’ Supply. I asked permission to use the the THoM logo and pictures of the products on an informational web site. They were very supportive. So, since 2010, I have been building kits and building the THoM informational web site. The building hobby is a great joy and the web site is a labor of love. Next Next post: Frustration: Do I Glue or Stain First? 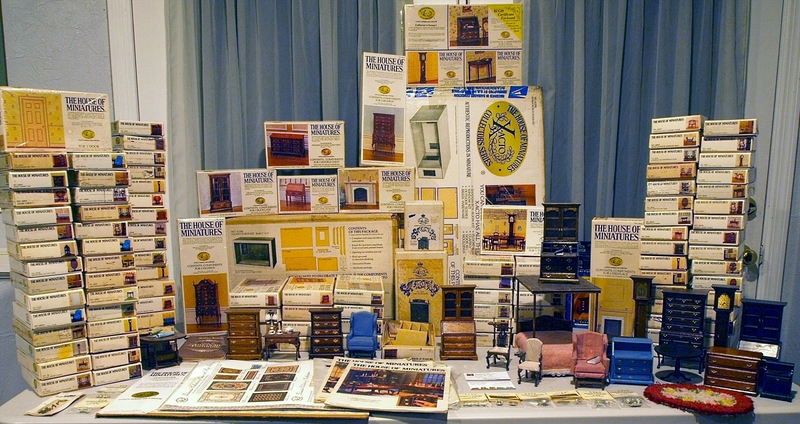 I purchased a loot of dollhouse items on Ebay one summer and there in the box were about 12 kits! Thus began my love for THoM! All were intact, instructions and everything. There was also the stain made by them to complete the kits! Of course that had dried out, but at least I have the bottles! (Yes, I am a mini hoarder of sorts!) Thanks for sharing your story and for taking time to create this site! So many things can be repurposed. I’ve used coffee stir sticks and Popsicle sticks for wood floors and they have come our better than some material made for that purpose. I recently was approached by a coworker asking if I might want to buy a sterility box of dollhouse furniture kits. They had paid $50 for the box. I said I would like to see what they were, first. She had pictures, a whole box of House of Miniature kits! I told her I would just give her $50! 50 kits in all!! Yay for me! An amazing bargain, for sure!